Emergency dispatch centers in Elk Grove and Sacramento, Calif., have over the past four months seen an increasing number of false alarm calls originate from an Apple facility in the area, with workers there fielding about 20 such calls per day. According to dispatcher Jamie Hudson, the calls are coming from iPhones or Apple Watches within an Apple repair and refurbishing center in Elk Grove, reports CBS Sacramento. As an emergency services center, dispatchers are able to see where calls are coming from, either through cell tower triangulation or information gleaned from onboard GPS, if such functions are active. When dispatchers answer a call from the Apple facility they are rarely met with another person on the line, suggesting the calls are being placed in error. "The times when it's greatly impacting us is when we have other emergencies happening and we may have a dispatcher on another 911 call that may have to put that call on hold to triage the incoming call," Hudson said. Apple acknowledged the situation and said it is working on a solution. "We're aware of 911 calls originating from our Elk Grove repair and refurbishment facility," an Apple spokesperson said. "We take this seriously and we are working closely with local law enforcement to investigate the cause and ensure this doesn't continue." Apple failed to specify why employees are making errant 911 calls, though the company's Emergency SOS feature could be to blame. According to the Sacramento County Sheriff's Department Communication Center, which received about 47 errant 911 calls from Apple since the start of the year, dispatchers can sometimes hear technicians "talking about Apple, or devices or generally about maintenance and repairs." The SOS feature, present on both iPhone and Apple Watch, is designed to be activated in a hurry. 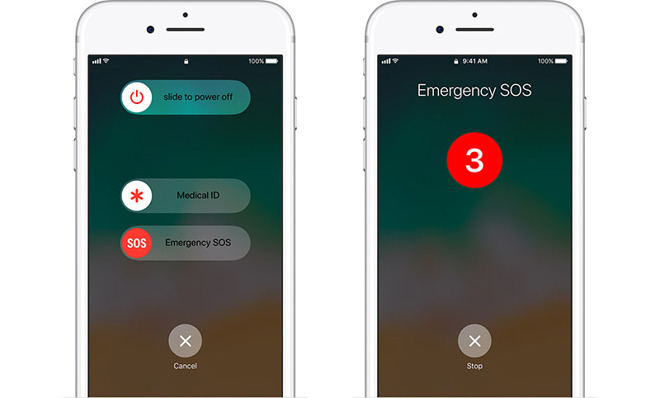 On current iPhone X and iPhone 8 models, users must press and hold the side button and both volume buttons to trigger Emergency SOS. Alternatively, pressing the side button five times in rapid succession achieves the same result. This latter method is also used to activate Emergency SOS on older iPhone models. When the SOS feature is triggered, a large timer will being counting down from three seconds and a loud rising tone is played through the device's speakers. Once the timer reaches zero, the call is automatically placed without further user intervention. Users can halt the operation by tapping on an onscreen "Stop" button and confirming in a subsequent menu. While the calls may be benign, the rate and consistency at which they are placed is a problem. So far, Elk Grove Police report receiving some 1,600 calls since October, each of which takes valuable seconds away from real emergencies. "The times when it's greatly impacting us is when we have other emergencies happening and we may have a dispatcher on another 911 call that may have to put that call on hold to triage the incoming call," Hudson said of the apparently accidental Apple calls.